AQUATAPE is a drip tape equipped with a continuous labyrinth, welded inside and drilled at a pre-ordered and constant spacing. AQUATAPE is used for the irrigation of open fields or into greenhouse, of a variety of cultivations in horticulture and ﬂoriculture, such as: strawberries, zucchini, peppers, aubergines, potatoes, cucumbers, onions, gerberas, roses, carnations, etc. ; thanks to its close drip spacing it is particularly suitable for irrigation on very draining soils, such as sandy ones. The inlet filters in the labyrinth and the turbulent flow that is created within it, allow a sensible reduction of the risk of clogging, which might be due to the impurities in the water. The linear water outlets prevent reflux and protect the labyrinth from root intrusion when installation is underground. The wide range of models available, makes AQUATAPE a versatile and practical product also for the making of DIY irrigation systems (BRICO AQUATAPE Line). 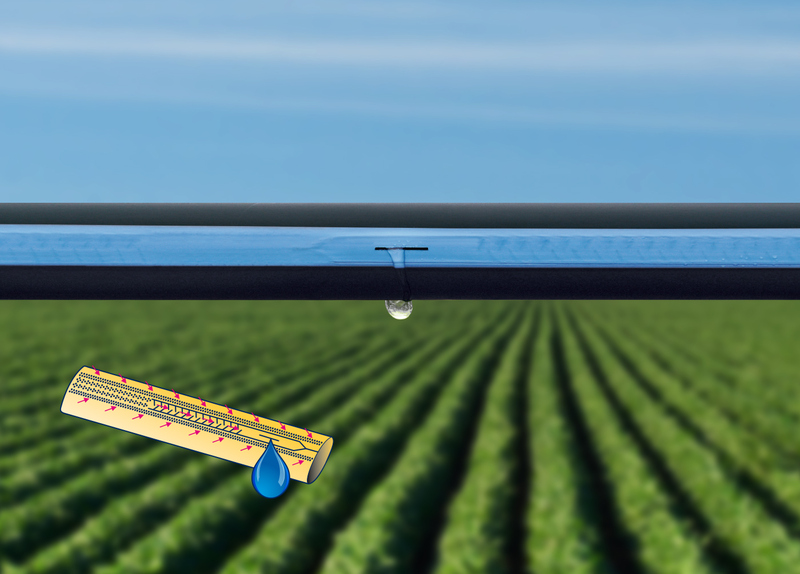 UV-resistant drip tapes to the attack of micro-organisms and moulds, saline water, acids or alkaline solutions normally used in agriculture. Flow rate uniformity over long distances. Internal Filters that prevent particles from entering the labyrinth. Linear water outlet prevents the intrusion of the roots and performs the function of anti-reﬂux. Blue Stripe upward displays correct laying on the ground.